Local artist, actress, director and educator, MarNae Taylor was the guest for the radio show, Artists on Art. It was wonderful to speak with MarNae having watched her magic for years both as an audience member as well as a parent of children under her tutelage. She has been a force in our community both as an actress and an acting teacher for middle and high schoolers at Georgianna Bruce Kirby since moving to Santa Cruz ten years ago. We talked about her work and art practice since graduating as theater and music major at Utah State University. Over the years, MarNae has played leads in such varied productions of All’s Well that Ends Well, Oliver and How I Learned to Drive. She has received several best actress awards. 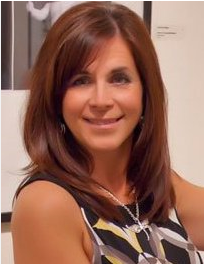 Currently, she is active in local improvisation and community theater groups such as the Jewel Theater. We spoke of her most current project, the upcoming production John Lennon and Me. This play is directed by MarNae and acted by Georgianna Bruce Kirby students. This is a very timely play considering the tragic passing of John Lennon on December 8, 1980. 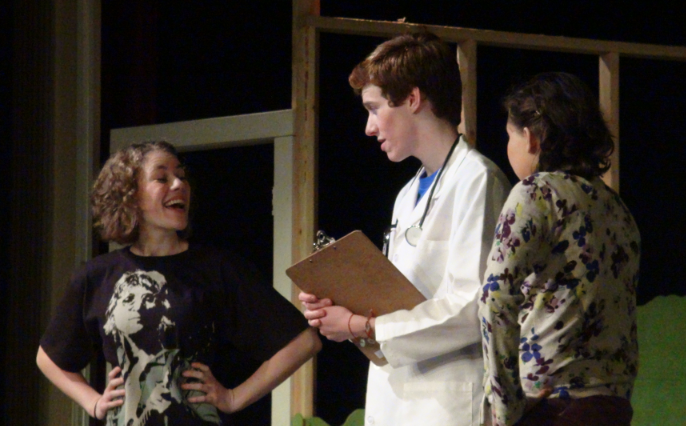 The play deals with the difficult themes of childhood rare diseases and how kids cope. The actors from GBK do a great job delivering emotional performances that pull the heart stings. Be sure to bring your tissues! Thursday, Dec. 9- 7:00 P.M.
Friday, Dec. 10- 7:00 P.M.
Saturday, Dec. 11- 1:00 P.M. and 7:00 P.M.
and Sunday, Dec. 12- 1:00 P.M. All performances are at Harbor High School (300 LaFonda Avenue). Following the Saturday night and Sunday matinee performances, a forum will be led by Victoria Rue, who has extensive experience working with hospices and is a very accomplished teacher, counselor and Priest. The picture below shows, left to right, Emily Olsen as Star Grubner, Craig Petrocelli II as Dr Scott Rhodes and Brianna James-Beckham playing Sally Kasem. 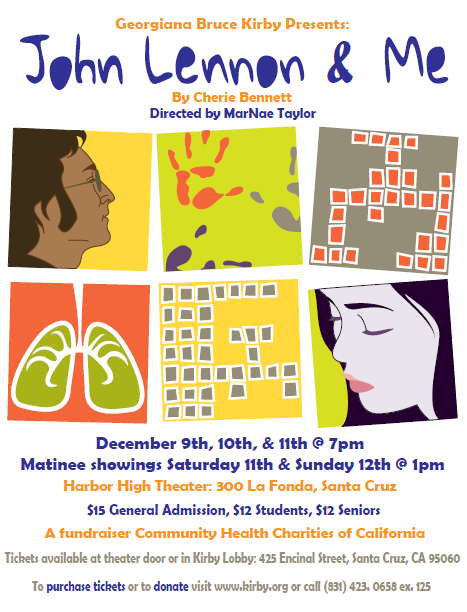 This play will benefit the California Association for Rare Diseases. If you would like to make a donation, contact MarNae Taylor at mtaylor@kirby.org. Tickets are on sale now in the Kirby lobby and will also be available at the theater door. To reserve tickets online click here. For more information, call (831) 423-0658. You can also find this event listed on facebook. The next production for MarNae will be the GBK musical, the “Putman County Spelling Bee” in March of 2011. 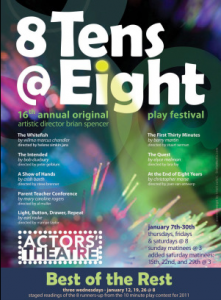 Along with her work with young people, MarNae is also participating in the local yearly tradition, 8 Tens at 8 at the Santa Cruz Actors’ Theater at 1001 Center Street. This is the 16th production of this unique and interesting short play festival and extravaganza. MarNae is directing on of the comedic original plays, “Light, Button, Drawer, Repeat” and is acting in “White Fish.” Opening night is January 7th, 2011 running four weekends in a row at 8pm. 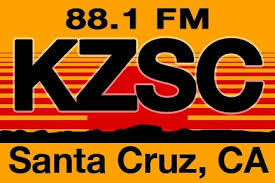 For more information please visit the Santa Cruz Actors’ Theater. While I have your attention…another GBK event is the upcoming concert: Songs For A Winter’s Eve happening Monday December 13 at 7:30 at the First Congregational Church at 900 High Street here in lovely Santa Cruz. Celebrate the holiday season with an evening of exceptional music. The Winter Concert features the talents of individual students as well as ensembles including the Chamber Ensemble, Chamber Choir, Jazz Ensemble, Jazz Choir, Treble Choir, and Chorus. A pre-concert reception at 6:30 pm includes finger foods and drinks with carol singing from the 2010 Chamber Choir and Choir Alumni. Admission is free. For a flyer click here.